Whether you are looking for windows for new home construction or replacement windows, you want quality residential windows that provide heat efficiency, are easy to operate and clean, and are available in the style and color that matches your house. We know residential windows can be a big investment that’s why our team is ready to work with you to find the right window from one of our manufacturers that stands behind their product. We carry several lines of residential windows from manufacturers known for their product design, features, colors and other window options. Whether you are interested in Low-E glass, insulated glass, or Energy Star rated windows, we have a selection of windows featuring the glass requirements you’re looking for. Our manufacturers offer a broad variety of window designs and styles such as single or double hung, casement or awning, bay or sliding, and many more. 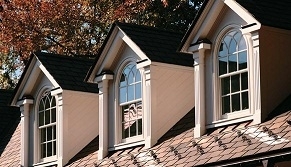 Different windows use different types of low-E coatings. We have the ability to identify and match glass no matter if it has a hard-coat or soft-coat low-E coating or is tempered safety glass. Let our team of window experts work with you to determine which window is best for your home, then measure your window openings, order, deliver and install your new windows. We offer these fine window manufacturers that provide a wide variety of window styles and window glass options to choose from with quality you can rely on. 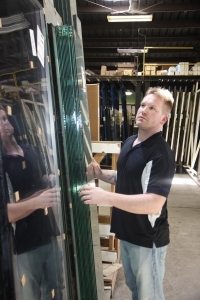 Atrium Windows and Doors has been manufacturing residential windows and doors since 1946. They specialize in vinyl and aluminum windows and construct their products specifically to be used for new construction or replacement. They offer a full line by style to meet your design need. Ecoshield offers a wide variety of vinyl windows for new construction as well as replacement windows, many of which are available with Energy Star glass. This manufacturer is known for their high-efficiency designs that cut energy costs and low maintenance construction to fit busy lifestyles. Ecoshield has a full line of styles to choose from. Weather Shield is a quality manufacturer of wood and vinyl windows. They have 8 collections to choose from with a broad selection of styles and finishes. Weathershield's commitment to innovation and customer service results in top performing, beautifully crafted windows for your home. Do you have a vintage house? If you have a beautiful older house with unique window sizes and designs and wondering how you’ll upgrade your original historic windows to new, more energy efficient windows we have the solution for you. We offer Weather Shield historic windows, a line of single-hung windows designed to look great as well as pass strict historic district zoning requirements. Historically accurate, these windows are made with all wood framing and thicker sashes. Increase the energy efficiency of your home with storm windows. We offer Ecoshield storm windows that feature a strong, durable finish and are available designs to complement all architectural styles. 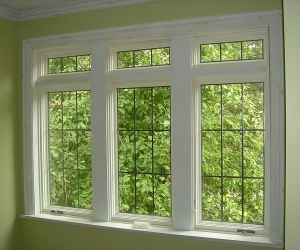 EcoShield windows are made available in standard and customs sizes. Flower City Glass has been providing replacement window glass for homes across New York State longer than any other glass company. Whether window glass is fogged or broken we have the tools to match any glass type and we are able to measure, order and replace glass in our shop or in your home even when they are in are hard to access locations. We have experience in performing glass replacement in all types of wood, aluminum, vinyl or even steel frame windows. Request a quote or contact us for more information on our residential window products.